As a member of the Millennial Generation, I have grown up in the digital age. I’ve had a Facebook page almost as long as I’ve had a cell phone. I have been active on just about every social media platform since I was a teenager, and even though my job now is to manage social media for companies, I still do it for fun. Yes, I learned social media when it was just that – social media. But now, it has become so much more than that. 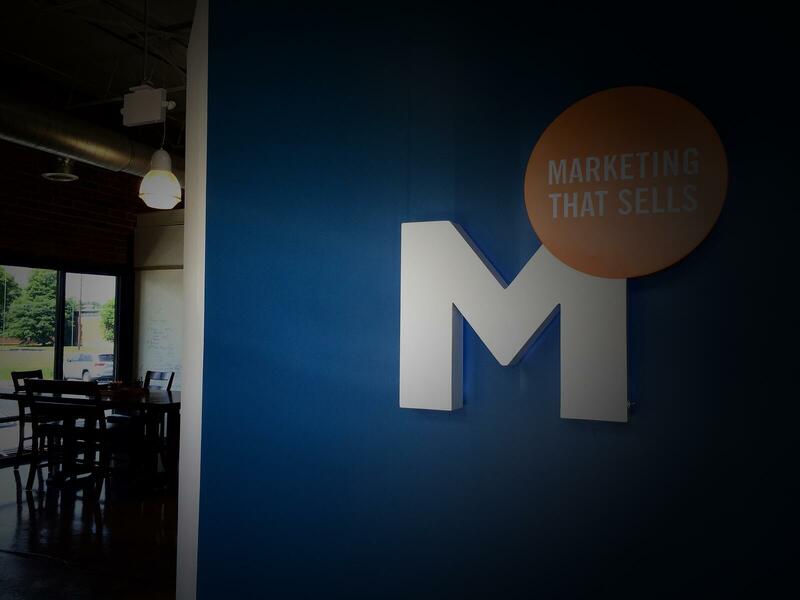 Social media is now a key marketing tool for businesses. Companies are successfully using it to engage with customers, distribute content, and generate new leads. Every business should be active on at least one social media channel. Believe me when I tell you that there are so many advantages to using social media, and ANY company can benefit. Still not convinced? Here are a few examples of what social media can do for your business: gain new customers, improve your SEO, build brand awareness, drive more website traffic, and transform you into an industry thought leader – just to name a few. One of our clients recently attended a LinkedIn seminar on best practices in social media for business. She wrote a great article recapping everything she learned -- check it out here: Social Media for Business: 5 Things Your Company Should Know. Unfortunately, not everyone grew up during the social media revolution, and many people are at a disadvantage when it comes to learning these new generation marketing tools. Lucky for you social media amateurs, you have someone who is well versed in the art of tweeting, retweeting, and hashtagging to give you some guidance. Like I said before, I manage social media for businesses, and I can’t tell you how many C-level professionals have asked me how to use twitter. If, like them, you are a total twitter newbie, you probably have no idea what any of those terms I just used mean either. But don’t you worry! I am about to transform you into a Twitter expert (or at least someone who knows what a hashtag is)! Twitter is a social media website that allows users to send and read text-based messages up to 140 characters long. These messages are known as tweets. Each user has their own unique username that is preceded by the @ symbol. For example, Marsden & Associate’s username is @MarsdenAssoc. Each user has followers – these are the people who see your tweets. They are essentially your subscribers. While you have your own followers, you are also following the people of your choosing. These are the people whose tweets you’re interested in reading and will appear on your tweet feed. This is displayed on the top left corner of your Twitter homepage. You can click each number to see a list of the people you’re following, the people who are following you, and all the tweets you have sent out. Your tweet feed is where you can read the latest tweets of the people you follow. The tweets appear in your feed as they are sent out. 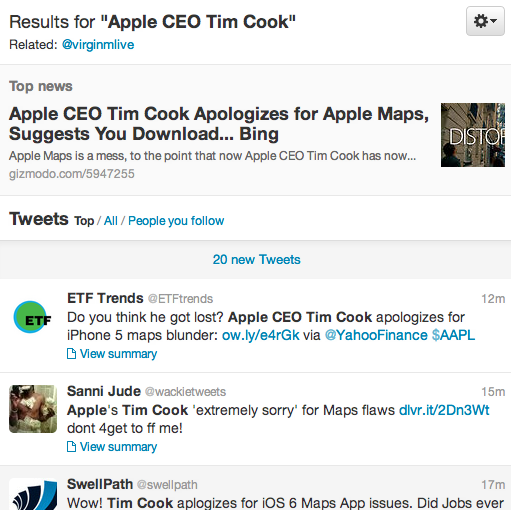 As you can see, you are taken to a live feed of all the tweets regarding Apple CEO Tim Cook. Hashtags are words or phrases that are prefixed with the # sign. Using hashtags is a way to mark your tweet as relevant to a particular group or topic. By including a hashtag in your tweet, it will then appear in a feed containing tweets marked with the same hashtag. This is the same idea as the trending topic feed displayed above. You can use popular hashtags (such as “throwbackthursday or #followfriday) or you can create your own (#MarsdenAssociatesRules) –we’re hoping that one catches on. Retweeting is a way to repost a message from another Twitter user for all your followers to see. A mention is a way to tag another twitter user in a tweet using the @ sign followed by their username. 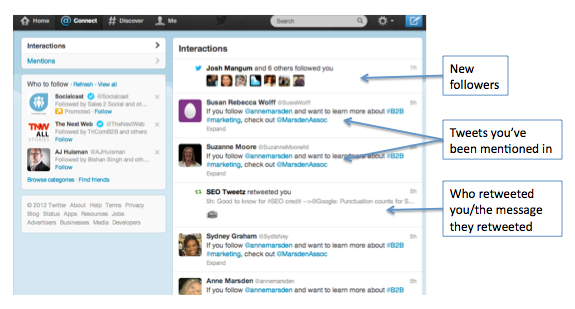 As you can see in the screen shot above, our Twitter savvy leader Anne Marsden has mentioned Hubspot in her latest tweet. 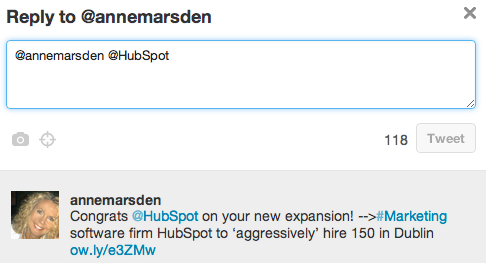 Hubspot will be sent a notification that Anne mentioned them in her tweet. This is a great way to reach out and interact with other users, and hopefully get your message retweeted for greater exposure. Because Anne also mentioned Hubspot in her tweet, their username will automatically appear in the reply message as well. You can choose to leave it there, or erase it and direct your tweet only to the person whose tweet you've chosen to reply to (in this case, Anne). 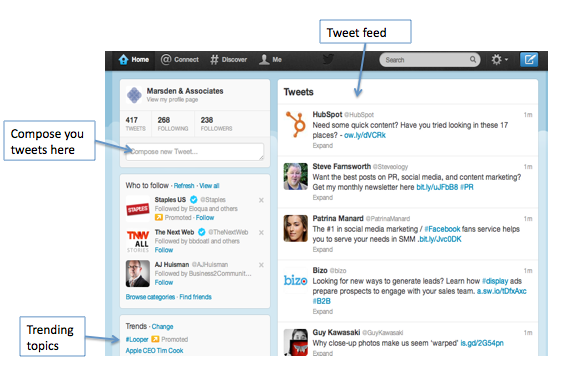 Connect is the page that displays a feed of all of your Twitter interactions. You can find connect on your dashboard (as you can see in the picture below). 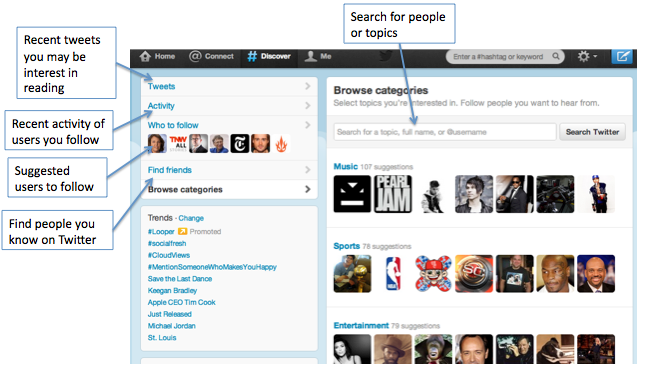 Here, you can see your latest followers, tweets other users have mentioned you in, and users who have retweeted you. Discover -- another option on your Twitter dashboard -- is a page that allows you to see what's happening on twitter right now, tailored to your interests. So what do you think? Are you feeling social media savvy yet? If you found this Twitter guide to be helpful, I hope you will pass it along to those people you know who still scratch their head when they hear the word hashtag -- remember, you were once one of them! If you have any further Twitter questions, feel free to ask away in the comments below! And since you are all twitter pros now and will soon (if not already) be managing your own Twitter account, make sure you connect with us on Twitter! Afterall, we did teach you everything you know.